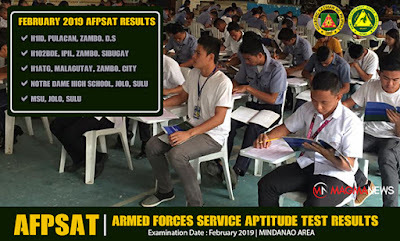 AFPSAT Results - February 2019 | Mindanao Area #AROMIN - Exam News, Reviewer, Military Career, & Everything [MN] . . 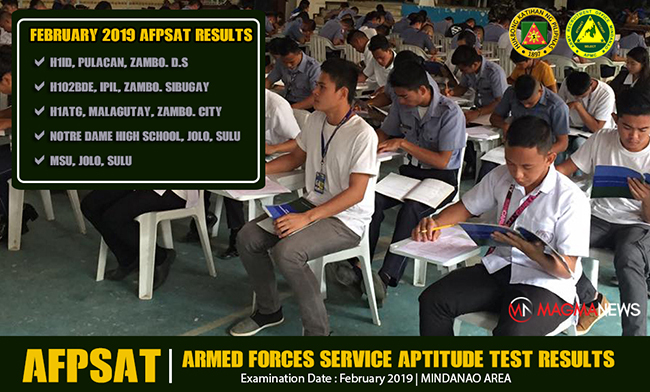 The Army Recruitment Office of Mindanao (AROMIN) has released the results of the Armed Forces of the Philippines Aptitude (AFPSAT) conducted at Pulacan, Zamboanga del Sur; H102BDE, Ipil, Zamboanga Sibugay; H1ATG, Malagutay, Zamboanga City; Notre Dame High School, Jolo, Sulu; and, Mindanao State University, Jolo, Sulu last February 2019. Below is the master list of examinees (still subject for validation) with their corresponding score, grade, and remarks. For Physical Fitness Test schedules and other info kindly check the Army Recruitment Office - Mindanao page for updates. Congrats to all passers! You're one step closer to your dreams as an aspirant soldier of the republic!